Includes a pair of adjustable rear 3 inch axle air bag brackets with hardware. Made of heavy duty 3/16 inch steel then black oil soaked with an anti-rust coating, these brackets are designed for performance. Mounts over or under your axle. Bolts on to frame and welds onto axle. Includes 2 axle brackets, 2 upper bag brackets, 2 lower bag brackets, 16 grade 8 bolts nuts, 2 2500 lb bags, 50 air line 2 elbow fittings. Material Steel Finish Black Oil Soak Anti Rust Coating Yes Thickness 3/16 Axle Bracket 2 Upper Bag Bracket 2 Lower Bag Bracket 2 Hardware 16 Bolt Nuts Included Hardware Grade Grade 8 Axle 3 Axles Adjustable 3 Mount Over or Under Axle Included 50 3/8 air line Included 2 elbow. 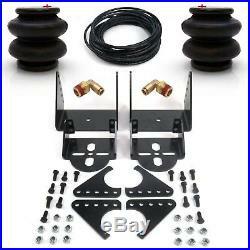 Rear Weld On Air Ride Mounting Brackets & 2500lb Air Bags Suspension Mount Kit. Material Steel Finish Black Oil Soak Anti Rust Coating Yes Thickness 3/16 Axle Bracket 2 Upper Bag Bracket 2 Lower Bag Bracket 2 Hardware 16 Bolt Nuts Included Hardware Grade Grade 8 Axle 3 Axles Adjustable 3 Mount Over or Under Axle Included 50 3/8 air line Included 2 elbow fittings Included 2 2500lb Air Bags. Helix Suspension Brakes and Steering. Stock photos may not be an exact representation of the item. Please read all product info, descriptions and terms before purchasing. All of your items fit in one box. Now we are bringing our expertise to the Automotive Parts and Accessory market to service you! Shop with the Confidence that you will get what you ordered lightning fast and Steves House Of Speed will be there to help along the way! The item "Rear Weld On Air Ride Mounting Brackets & 2500lb Air Bags Suspension Mount Kit" is in sale since Monday, October 09, 2017.